The parable of the labourers in the vineyard (Matthew 20, 1-16) is one of the most famous told by Jesus Christ. However, it is rarely used as a motif for works of art. 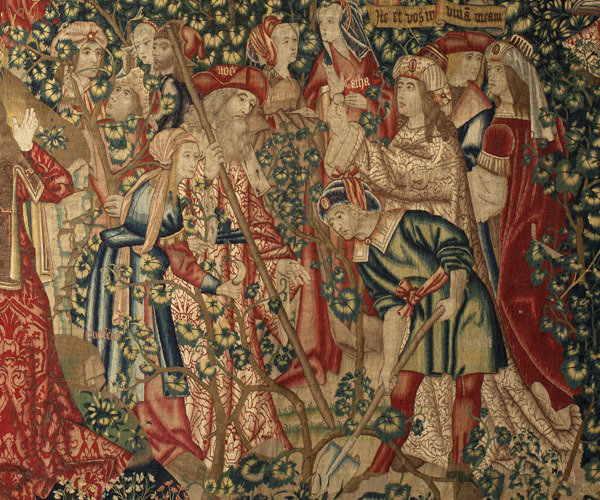 Regarding representations in tapestry, two series are kept, both of them in Spain: one in the Cathedral of Zamora, and another one in the Patriarch College of Valencia. In both cases, these series are comprised of just two pieces each: ‘The Call to the Labourers’ and ‘The Payment of the Denarius’. It is unlikely that there were any more, because the evangelical parable is fully described in the different scenes represented here. The author of the cartoons is unknown and his skill as a painter was limited. 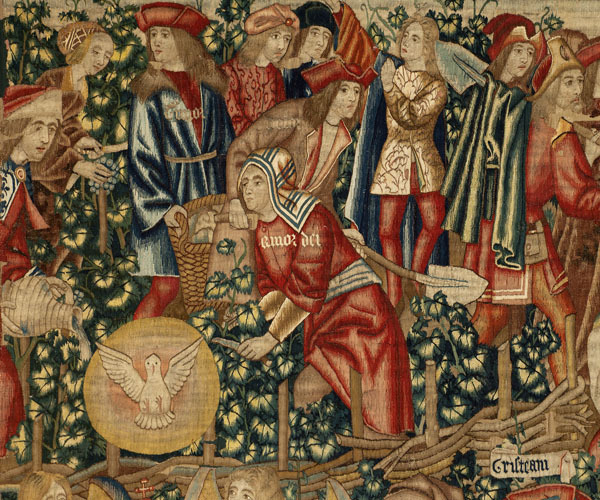 The weaver is also unknown, although the style would point to the workshop of Pieter van Aelst, the weaver to Philip the Handsome who travelled to Spain with his master in 1502. 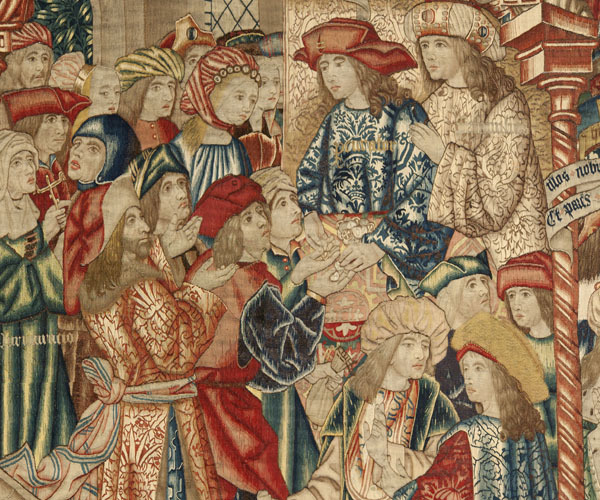 Although the panels were probably woven around 1500 based on the same cartoons, the Valencia tapestries are slightly wider and contain a few more characters than could be fitted into the Zamora ones. 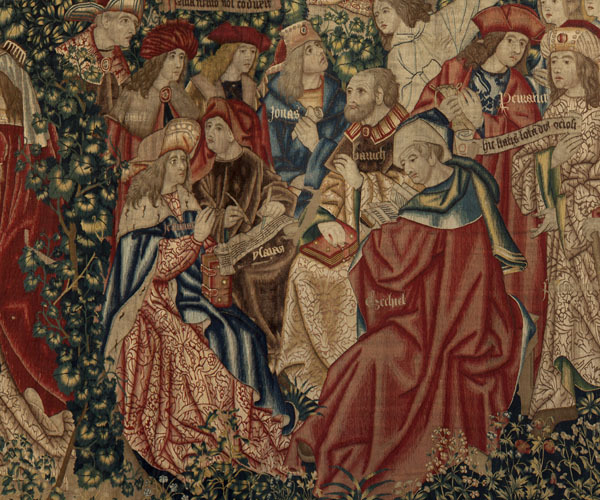 They feature the horror vacui of the late 15th century, their entire surface covered with characters surrounded by architectural and vegetal shapes which, rather than separating them, bring them closer together. They are framed by a border of about 25cm, and their state of conservation is quite good as regards colouring. Even though there is no doubt that this series refers to the parable of the labourers in the vineyard, the source may not have been exclusively the evangelist Matthew; another potential source is the writings of Saint Jerome. This Church Father compares the different hours when the labourers are called to the different stages of human life. Man can be called to God’s service at any age without diminishing the person, and thus anyone who fulfils the task assigned will receive the same payment: Paradise. The interpretation of Saint Jerome was taken up by other Christian writers such as Bede the Venerable and was popular throughout the Middle Ages. Two other pieces comprising a series woven from the same cartoons are kept in the Patriarch College of Valencia. There are small differences with those in the cathedral of Zamora, but the inscriptions are in better condition in Valencia, which facilitates understanding of the former (whose inscriptions are sometimes lost).